formal dining room: dead or a mark of adulthood? Recently, a friend at one of our Friday Night Meatballs dinners remarked as we set the table in the dining room that I must be a real adult because I have a dining room that I don’t use every day. It made me laugh. I thought of his comment when I saw a post on Apartment Therapy called “Is the Formal Dining Room Dead?” Many of the 91 comments seemed to agree that the formal dining room is a thing of the past, with many folks preferring to eat at counters, breakfast nooks, in kitchens, and in other “open-concept” multi-function rooms. Our dining room, being put to good use at Friday Night Meatballs. Here’s the thing: my “front room,” sort of a living/dining room, is my favorite room of the house. I guess you could call it “formal,” since it’s full of our nicest things and is a space I keep free of kids toys, and, in fact, where my children are rarely allowed unsupervised. But that actually makes it “work” great for us. 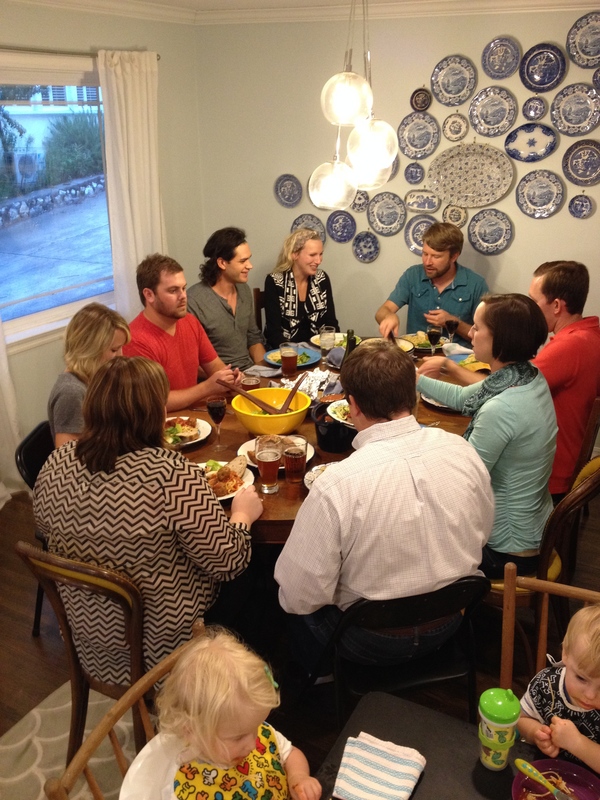 While we eat most of our meals around a four-seater table in our breakfast nook, any time we have one or more people join us for dinner, we eat at the dining table. And more and more as we host not just Friday Night Meatballs but also things like: a baptism brunch, baby showers, a Christmas party, wedding showers, and other gatherings, having a large “formal” dining table that expands from a small circle to a four-leaf oblong table that seats up to 12 has made having a “more the merrier” attitude about hospitality quite easy. I also just love how the space has come together now that we’ve been in our home for almost two years. What at first seemed like a strange room with a freestanding closet and an ugly builder-grade iron chandelier has become a space that I really love. The front window is huge and looks over the whole street. The light is gorgeous in the afternoons and evenings. There’s art that I love on the walls, and we covered the largest wall in a blue and white plate collection that I inherited from my grandmother. My husband has a real piano to play (instead of the keyboard he used for years), all our books have found a home, and my great grandfather’s china hutch houses china inherited from Jon’s family and all the prettiest things we’ve been given as gifts. Here you can see the weird free-standing closet and straight through our kitchen (that big thing is my husband’s kegerator; he’s a home brewer), into our breakfast area. The den is beyond that. Our house is really long. I watch all these HGTV shows where people are knocking down walls for one big living space and I think, these people are nuts. Our house is a nice balance of open and separate– the main living spaces flow into each other, but you can’t see a sink full of dirty dishes from any of our sofas. And I like that we have a den/play room on the back of the house, the kitchen in the middle, and the “front room” just off of that. I get to preserve a nice grown up space (which is also where I hide out with tea and books during nap times or when the girls are playing, so I’m not looking at kid clutter when I want to relax) for entertaining. I guess the difference is: our formal dining room is not a show place, but a room where we do a particular piece of our living. We had Christmas morning there. We eat our Friday Night Meatballs there. We play the piano there. We eat meals with friends there. We hide from our children there. We look out the front window there. The cat basks in the sunlight there. We often park our stroller there. There are no chairs you can’t sit on, no surfaces I will yell at you about if you put down a glass, no books that can’t be put back on their shelves. It’s a living, breathing room for us. It’s not dead at all. My favorite art: a painting Jon brought back from Haiti, a painting by my great uncle, the origami crane lamp I originally made for the girls’ room, and a photograph taken by a friend. This reminds me of my unused dinning room with a table cluttered with my mom’s silver and fancy plates from France. I have one white Ikea lounge chair, and two clear plastic ones. I’d love to have such a dinner party. Mario: time to put those plates and silver to use! It’s certainly changed my life for the better! I also love how the plates on the wall look like a flock of blue and white round birds taking off and your friend’s photograph. It is very good. If you’re wanting to hang the plates, we have multiple hangers you could use, as we bought them in a larger set and have no use for them. I really like the idea of a formal dining room – or at least a dining table that is not used to very day. In my mind it seems to make the occasion more reverent and special. We have the space in our lounge room for our large dining table and I have been look great for a smaller Round table for a while now so that we can achieve this in our home. Your home is lovely. Sorry, tiny bit not tiny but ! !